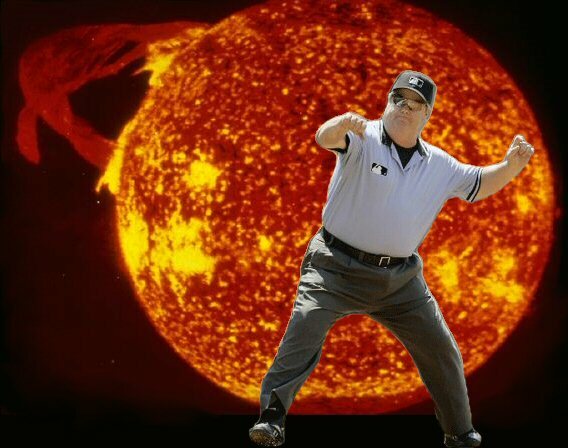 It may be that Joe West is merely ejecting a fiery celestial body from the firmament. If that’s the case, then nothing here is too surprising. After all, Joe West, when not in umpire blues, wears four-button spats, top hat and monocle and carries in his breast pocket a cigarette case and in his sock a pearl-handled revolver. So ejecting a burning sun is the sort of thing that sort of man does and does well. But what if this is an urgent cable that tells us Joe West is … in danger? Perhaps Joe West, with his usual righteous certainty, is ejecting something else while this sinister ball of fire — normally tethered to the heavens — attempts to murder the great Joe West. After all, Joe West has a long and unfortunate history of being ambushed by flame-kissed planetoids. To date, he has walked away from all such attacks, but will he this time? If anyone can survive a giant boulder heated up to three million kelvin, it’s Joe West. Right? RIGHT?!? An urgent people wait with bated breath for the next installment of the Adventures of Joe West, should it ever reach us. We hoped you liked reading Joe West … In Peril? by Dayn Perry! Not unless you get through me! !